Our trademark registration script serves in building a connection between audit forms and customers. In recent times, businessmen are running out of time to acquire sufficient legal services like auditor forms for their business. As it implies, we are in the digital world and the entire world is shrinking into a tiny screen and people expect a particular place to accumulate their time and energy. Audit management system is ensuring the board-approved audit directives. Income Tax Return Filing‎ script has been implemented to serve simplicity, a well-organized work-flow and collaboration process of compiling audits. We have established this Chartered Accountant Auditor Website with the basic conception that includes the most elite features in our Income Tax Return Filling script. This indiafilings script handles legal government documents like pan card, government identity card and provide legal services for auditing. 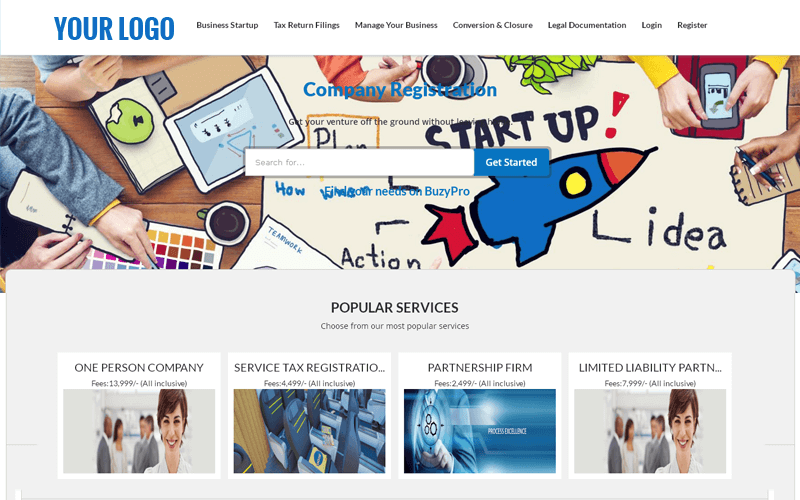 It initiates business and helps the business to grow further, and the entire business necessities such as tax details, tax filling details, trademark & copyright, legal documentation, book keeping service. Any type of audit relevant forms can manage by the indiafilings clone script which is an entirely automated. Through admin, you can segregate the services and financial auditing. Admin has the ability to add the sub-admin as their own employer which can be entirely control by them. The entire website has the details about registration per day, week and monthly and financial details & client services. Customers can search their auditing requirement throughout the website based on their requirements and choose their category, serviced and login to trap their services. This site is highly secured and encrypted. Some of the features in the IT Return file script are as follows responsive design, SEO-optimization, profile management, feedback management, subscription management, business form management, order management, upload document management, legal forms management, testimonial details, newsletter subscription, user-friendly CMS page, different payment gateways. As an auditor, you can be comfortable with your customers through service tax registration script with the payment confirmation details and you can keep a good relationship with your customers. The uploaded documents will be encrypted via our secure management software that is plugged into the script. Through the admin dashboard, you can supervise all the front-end activities and you can seek assistance from the revenue models from the mutual commission and membership plans. Using our open source code, you can customize the entire Chartered Accountant Auditor Website as per your perception and requirements with your extreme technical knowledge. We know that getting your website to the users is necessary; hence we have made our script to be SEO-friendly by optimizing it with Google standards which makes your site come on top of the search results, thereby increasing your sites ranking and get more organic search results through the visitors from the search engines directly. We also provide 1 year of technical support, free updates for the source code for 6 months, and brand-free. Once you buy our product, we will provide you with the full source code and your website will go live within the next 24 hours. Support is great! Answer quickly and accurately! CMS auditor script is very beautiful, clear and neat design. Has a lot of functions and is very flexible to adjust. But the biggest +++ is the support ! Working with this script is really fun with such an helpful support ! I like the script and the support. The people are very helpful and very friendly.